Suicide Silence's Mitch Lucker sports a serious tattoo on his throat. It's the kind of ink you can't hide even if you tried. But it's no big deal for Lucker. "I am tattooed on my hands, my fingers, my hands. And my neck. The whole front of my body is covered, but not my back," he told Noisecreep. The vocalist offers a logical explanation for why he doesn't tattoo his back, saying, "I like seeing the artwork because it is artwork! It'd be like owning an expensive painting that you can never see. Like, 'Oh, I have this beautiful, expensive painting, but you can't see it because it's at my uncle's house.'" Lucker is also not concerned about his formidable, tattooed look hindering anything in his life in the future. "It's not uncommon to have an overwhelming amount of tattoos," he reasoned. "You see it all the time nowadays, but it's also who I am. I had my arms and neck tattooed when I was 18. It hasn't slowed me down at all." 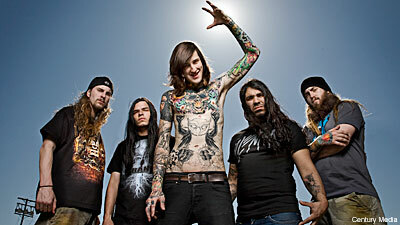 Lucker also admitted that he has a bit of "an OCD issue," where he has routines that he follows. That can't be comfortable for a touring musician who is constantly uprooting and living a lifestyle that hardly allow for patterns or regimens! "I have few routines, but not too many. I like things to be clean and organized," he said. "It is hard sometimes. It's hard to get off the bus, because I know how many dirty, dirty handshakes people want to give me, but I have to get over it."